Notes from a lecture delivered Monday 8th Februaury 2010, Newcastle Arts Centre, Westgate Road. Part of the Visions strand of the Explore Membership Scheme of the North East Centre for Lifelong Learning. 1921 Born in Krefeld. Grows up in Kleve near Dutch border. Father runs a dairy co-op, mother is the receptionist, both Catholic. 1930 Hard times for his father. 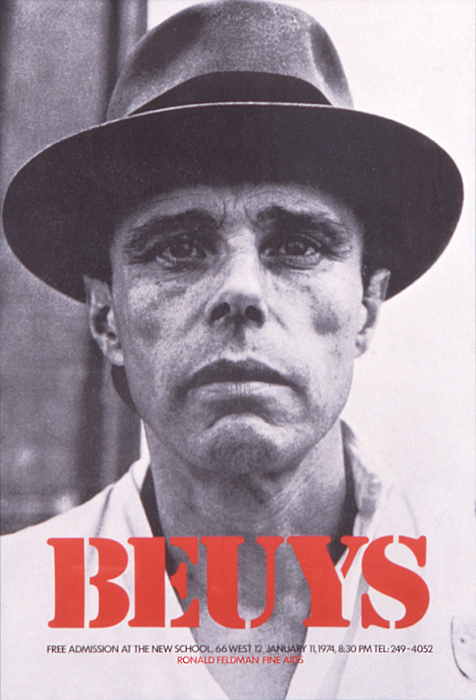 Beuys begins interest in plants and animals. 1933 Nazis take control of local government in Kleve. 1936 participates in Sternmarsch to Nuremberg organised by Hitler Youth. 1960s begins exhibiting career. Controversial avant garde activities culminate in support for student occupation of the Kunstakademie. 1970s regular visitor to Edinburgh Festival. (70, 73, 74, 80, 81) Part of his Free International initiative. Travels to US for first time. Holds retrospective at Guggenheim 1979-80. 1980-86 inaugurates the 7000 Oaks project at Dokumenta VII. Writes Anti-Reagan pop song, is elected Green Party candidate for Bundestag but withdraws disappointed by level of support. Hugely active in international art world. Develops lung problem in 1985 leads to death from heart attack in his studio, January 23rd 1986. 1941 training as radio operator. 1942 Russian front, Czech training school. 1943 writes to parents from Italy that he has decided to become an artist. 1944 recieves the “Medal for fighter pilots”. Crashes in Crimea, hospitalized, receives Iron Cross. Continues training as combat pilot. 1945 part of the “Erdmann Phantom Division” on Western Front. Wounded late April, awarded medal then captured by British May 9th. Returns home to family August 1945. 1950s Self-doubt, money troubles and PTSD. Works as a sculptor in Dusseldorf but suffers depression for which he is treated at psychiatric clinics in Dusseldorf and Essen. By end of the decade he has large commissions for war memorials and has married. 1961 holds first one person show, Kleve. Appointed professor at Kunstacademie Dusseldorf. Meets Yves Klein, Naim June Paik and George Macunias. Mark Rosenthal (2005) Joseph Beuys Actions, Vitrines, Environments, TATE.